In my head and through conversations with others, I’ve written this post a thousand times. Almost anyone who visits Israel knows to expect a relatively hard time at airport customs. Google the subject and you’ll find an abundance of information on preparing for the occasion, as well as many blog posts on the innumerable times when the process went terribly wrong. Generally, Israeli customs officers glimpse through your passport and ask a few questions about the purpose of your trip; then, you are finished and set free. But many people become subjected to extra measures taken in security’s name. I don’t want to downplay the diversity of ethnic/national categories from which the singled-out come, but the Internet will tell you very clearly: if you are Muslim or have a name that sounds Muslim (whatever that means), you’ll probably face much more trouble. Stay calm and just answer their questions, they say; if you’re here with good intentions, everything will be fine. If your passport has stamps from other Muslim or Arab countries, they’ll ask about that too—but just cooperate and you’ll be finished in no time. For the majority, it actually is that simple. Take note: both Mark Rosenblum alone and previous Ibrahim Project trips have brought Muslim students to Israel, and they rarely faced difficulties entering the country. But too often, it results in horror stories that reveal the absurdity of the airport’s practices. Before our program began, I’d read stories of people who were subjected to hours of questioning, some even forced to open their email inboxes to ‘prove’ that they weren’t planning anything dubious. El Al Israel Airlines is also known for humiliating prospective passengers. I figured that I would be okay, though—after all, I was with a group of five other students and two other adults, my passport was empty except for unsuspicious visas from Oman and the U.A.E., and I am an American-born U.S. citizen. Anyone who knows me knows I’m not dangerous, and I figured the Israeli authorities would easily see that too. Boy, was I wrong. All eight of us—me, the other five students, Mark and Aaron—approached Passport Control as a group and explained that we were on a study tour together. The officer took our passports one-by-one, checking our names, backgrounds, and previous visas before letting us through to claim our baggage and leave the airport. Mark, who visits Israel about ten times a year, got through quickly, to no surprise. Next were Jake M. and Jake G., the two Jewish students in our group—they too were allowed through swiftly. But when Sundus—an American-born Muslim of Egyptian descent, who happens to wear a hijab—approached the booth, they took her passport and asked her to step aside for a moment. Mark tried to explain that she was a student and this was unnecessary, but to no avail. I was next, and unsurprisingly they barely glanced at my passport before pulling me aside as well. The last three members of our group—who all happen to be Christian—got through in a snap, while Sundus and I were escorted to a closed-off corner of the room to wait for questioning. Mark came along to ensure that things went as smoothly as possible and to vouch for us when necessary (I can never thank him enough for being there for us). I looked around to see who else was blessed with this extra attention; I remember their faces vividly. I acknowledge that race is arbitrary and ambiguous enough that it’s usually difficult to distinguish someone’s ethnicity based upon their appearance—but from what I could discern, almost all of the others in the waiting area were (ostensibly) Arab. There was a family, two brothers, various individuals, and a pair of men dressed rather ‘Western’ but with kuffiyehs around their necks—which they eventually removed, for reasons that aren’t difficult to infer. I also noticed a South Asian family and one East Asian. And then there was me and Sundus. Mark stood his ground outside the entrance of the space. After almost an hour of waiting, I was the first to be called in for questioning. I sat down in front of a desk in a generic-looking office as a woman asked me various questions—some basic, but some that just seemed excessive. At one point a colleague of hers walked in and participated as well. Among other things, I was asked my name (seriously? ), my father’s name, his father’s name (which I actually had to think about for a moment before I remembered, prompting me to realize I didn’t know my grandmother’s name at all, because none of these people that so interested this woman were even part of my life), where I was born, where my parents were born (Pakistan), whether I’ve been there, when the last time I went there was, why I’m in Israel, whether I’ve been to Israel before, whether I know any Israelis, and where in Israel I would be traveling. Both women were very matter-of-fact in their approach—I did not feel like I was being interrogated (at least this time around), with all of the harsh connotations of that word. Quickly, I was sent back to the waiting area. When Sundus had her turn, she was asked most of the same questions (although the Egyptian visas in her passport made clear whether and when she had visited her parents’ place of birth). No big deal. We waited some more. Various people came and went, but some others were detained like us for just as long. The woman guarding the area was friendly, talking and sharing laughs with some of the waiting travelers. In the meantime, another traveler stormed through the area as he complained vociferously about how he had been wronged and shouldn’t have been pulled aside; “I’m Jewish!” he exclaimed. I quickly learned that he was a Persian Jew. He pleaded, “I have an uncle in Iran who was jailed for being a Zionist!” He was so visibly offended that he, a Jew, would be singled out for security measures in Israel, the homeland of his people. Yes, he was Iranian, and to say Israel and Iran have poor relations is an understatement, but he was also Jewish, so what gives? In a way, this particular situation revealed the absurd injustice of it all; being Jewish was not enough to redeem an Iranian, but would it really be more just to doubt him if he were not Jewish? Unrelentingly, the man scolded the customs officers and told them that they needed “smarter security.” I later found out that he was so persistent that they eventually just let him go. I found this remarkable—not just that they let him go, but that he had the audacity to argue with them so confidently. The rest of us, well, we just accepted something we knew was wrong for our own convenience. Perhaps we should protest and assert our own good names, but we don’t have a Jewish identity to fall back on, so we fear we might just appear more suspicious. In this complex procedural and psychological arrangement, our awareness of being ‘otherized’ quells our motivation to speak against it. It’s so truly bizarre, so difficult to even try to describe with specificity—but I know that many others who have been detained at airports or borders, and Muslims who have been discriminated against in my own country, know exactly what I mean. Anyways. After more time elapsed, I was called in again. This time I was questioned by someone else—another woman (why was it always women? ), equally stern as the previous two but much scarier. Physical descriptions are often unfair or uncalled for (especially those of women), but I have to be honest that her appearance contributed to my intimidation: she had huge, jet-black eyes that seemed to stare right past my soul. But I remained calm and spoke with disinterest. There was another man in the same office room, but he only sat back and observed as his colleague took the lead. She asked questions similar to before, but with more specifics. And that’s when things got weird. First, she asked me to write down my home phone number, my cell phone number, and my email address (I wondered if a forced email search was imminent). I gave her our program faculty advisor (Mark)’s name, the program leader (Aaron)’s name, and I identified the Institute of International Education as well. Again, she asked if I know anyone in Israel—any Israelis or Palestinians—or have any type of connections at all. I said no, and I told her that I was with a group—and she reacted with surprise, as if she didn’t know! I had just told her the names of our program advisor, leader, and host institution, and yet she didn’t understand; I had told every other officer with whom I’d spoken that we were here as a group on a study tour, but apparently they weren’t sharing the information they collected. Great interrogation strategy. She then asked (again) where my parents and I were born and whether I’ve visited Pakistan; she continued, asking if I still have family there, who they are, and whether I talk to them. Finally, she started asking specifics about the actual program that brought me to Israel—what it is, who funds it, where we’re going, and why I wanted to participate. This segued into questions about the school I attend and what I’m studying there. She asked me if I knew Sundus, and I told her how we go to the same school but hadn’t met before the program began. She asked where in Israel we were staying, so I pulled out the program guide to check the names of the hotels. I offered to show her the itinerary so she could see exactly what we were doing. She took the booklet and flipped through rather quickly; she didn’t seem at all concerned with the pages headed “Oman” or “UAE,” even “Tel Aviv” or “Jerusalem.” But when she got to the page that detailed our plans for Ramallah, she paused and looked more closely. And when she was done looking, she wrote down the names of every single Palestinian we were scheduled to meet. Finally, she let me go…back to the waiting room. I was asked to call Sundus in for her second round of questioning. I still didn’t have my passport back. I sat back down, feeling exhausted and completely demoralized. Mark came in and asked how I was doing. Apparently he had been in and out of the area, talking to and/or yelling at various people and trying to speed things along. Bless his persistence. Some time after Sundus returned, Mark’s magic finally worked and the same man who had an hour earlier observed my interrogation (see how quickly it became easy for me to call it that) came over, handed me and Sundus our passports, and told us we were free to go. Mark was more livid than anything else. Later he relayed to us the details of his arguments with the customs officers. Long story short, he revealed their incompetence. Apparently they suspected that another person sitting in the waiting room was also in our group but that we weren’t disclosing this. I tried to think—had Sundus or I spoken to anyone else as we waited? Yes, in fact. I said bless you to the man sitting next to me as he sneezed. How suspicious. Regardless, if these officers had bothered to read our program book they would’ve seen all of our names and everything else they could ever want to know about our trip (but instead, they fixated on the one page about Ramallah). And even if there had been something suspicious going on in our group, why should only Sundus and I be called out? Wouldn’t the whole group be complicit in allowing this to happen? Why are only the Muslim two eighths of the group deemed suspect? In fact, even if they were only concerned about Sundus and I alone, shouldn’t the rest of the group be suspect for bringing us here? The flawed logic here was astonishing. But such is the flawed logic of racism. So Mark scolded the woman who questioned us last, and said, “How about every time I bring an Arab or Muslim over here, I send over their names so you can do your three hours of research beforehand instead of making us wait like this?” The woman was quite shocked, as if she wanted to say, “Are you kidding me?” However, the other man in her office—the one who brought us back our passports—expressed that he felt terrible, apologized, and ended things immediately. And he also revealed that, before Mark’s intervention, they had planned on taking us back for questioning two or three more times—and only then would have decided whether to let us in the country or send us back home. There is only one way to describe this: outrageous. I’m not someone to make a big fuss over a little discomfort. I can only hope I have portrayed it sufficiently, but this experience was truly disheartening. I meant what I wrote; the second round of questioning, which indeed felt like interrogation, left me drained and acutely disillusioned. And I may now write with a bold tinge of attitude, but this is only a way of dealing with the pit in my stomach that returns every time I think about what happened. Everyone tried to lift my spirits, and I made an effort upon myself as well—but my mood was completely ruined for the remainder of the evening. Finally driving and walking through Tel Aviv, I couldn’t escape the first impression it had given me. This aftertaste persisted through fun and laughter at dinner in a beachside restaurant. It was only after a night of sleep that I woke up feeling refreshed and ready to look for something more. It’s always hard for me (and especially so after this incident) to separate political issues from my perceptions of Israel, but I was genuinely excited to finally visit this country that I had been learning about for so long, a country that many of my friends love and cherish. But after everything that happened at the airport, it was clear that this country did not welcome me. Now, I completely understand Israel’s security concerns. I understand that they happen in a certain context, which some would be quick to remind me—but I am aware of the seriousness of the security situation and agree that measures must be taken to prevent the very real problem of violence (which is perhaps more imminent for Israel than for my own country). However, I agree with the obstinate Persian Jewish traveler who scolded airport officials for needing “smarter security.” How good can your security measures be if they are capable of wasting excessive time and resources on two obviously harmless travelers like me and Sundus? Security requires caution and prudence, but this is quite clearly a policy of racial profiling motivated by a certain vicious type of paranoia. Make no mistake: Sundus and I were singled out solely because of our Muslim names. We were traveling with two other adults and four other students—three Jews and three Christians—but somehow only she and I were deemed suspicious. We were all part of the same American group and had the same plans for our time in Israel, but somehow only mine and Sundus’ participation was assiduously questioned. Forget neutral harmlessness; it could even easily be the case that we were avid supporters of the country, but in this system of shallow profiling it would not matter. My first name is Persian and my last name is Arabic, but that says almost nothing about me—yet these security measures so corrupted by out-group antipathy cannot see through that. The day this occurred, WordPress stats revealed that my blog had received views from Israel as a result of someone Google searching my full name; I am absolutely certain these viewers were the airport customs officers. I hope they felt appropriately inane after spending so much time investigating an 18 year-old ‘threat’ only to see the words “Peace, Shalom, Salam” shoved in their face at her “About” page, where she details her interests in conflict resolution and diplomacy. And just think: after seeing that, they still wanted to keep me around for further questioning before deciding whether I was worthy of entry into the country. Regardless of whatever justification one may posit for this heightened fear of certain ethnic/religious groups, it still remains that Muslims and Arabs are not welcome to Israel—at least not as much as everyone else is. Of course I do not mean that every individual Israeli is unwelcoming in this way, and all of the Israelis I have actually met are gracious and tolerant. My point is that, at the level of the state and official policy, we are seen as inherently suspect (and this is how racism generally works: it’s not about individual interactions or dispositions, but larger societal patterns and whole discriminatory systems). This is not just me projecting Tel Aviv airport policy onto Israel as a whole (although the way Israeli airports and airlines treat my specific demographic is certainly quite telling). I know that actual Israelis would agree with this assessment, whether it is something of which they are ashamed or supportive. But this analysis is also based on my knowledge of the state—accumulated from years of reading and listening, as well as our week of on-the-ground studying. If we had spent more time in Tel Aviv, we would have inevitably encountered ongoing harassment and protests against African immigrants. If we had been in Jerusalem only two weeks later, we might have witnessed the lynching of Arab kids by Jewish ones. What we did see was that even occupation policies, which represent a unique kind of injustice, involve a certain procedural prejudice that goes beyond their control over Palestinians. For example, it is expected that West Bank Palestinians are treated a certain way at checkpoints; some may justify these policies for various reasons but would still argue that they are mainly designated for Palestinians. However, when our group was traveling through the West Bank, an American identity did not prevent facing extra scrutiny at checkpoints. There was one instance at a checkpoint where Israeli soldiers didn’t even bother to glance at Jake M. and Jake G.’s passports, held out openly for inspection—yet not only did they look through my passport, but they also took great pains to thoroughly inspect every page of Sundus’ passport. Sundus wears a hijab and I do not, thus she is more visibly ‘Muslim’ (whereas my skin color alone is apparent reason for suspicion). I remember how, as the soldiers stood there poring over her passport, all of us looked at each other in shock and frustration. Again, it did not matter that we were all traveling as a group, that even if one of us were somehow a ‘threat’ it would make us all complicit; again, people like Sundus and I were blatantly singled out (and the two Jewish guys in our group were given a pass). Though I suppose that, after our first experience upon arriving in the country, we could not truly be surprised. It must be noted, however, that all of these events are negligible in comparison to what Palestinians experience every day. My encounter with airport discrimination is nothing relative to what many Palestinians face, and having Israeli soldiers enter your bus and search your passport is hardly the full, often brutal checkpoint experience. I speak of prejudice, but many have explained how tragic it is that Palestinians as a whole are treated as inherently suspicious regardless of their background or even their age. Furthermore, if these incidents did anything other than reveal prejudices, it was that their personal, affective impact made me better appreciate the feelings of Palestinians who face much worse (although I realize I will never truly understand their experience). It is also important to understand that all of this ties back to Israel’s identity as a Jewish state—not Jewish in essence or in religious values, but as a homeland where a tiny national group seeks to find safety in demographic majority. I’m not going to make normative claims about the value or legitimacy of the Zionist project, because I think it should be clear to anyone regardless of their position on such matters that the resulting insecurity about Israel’s future is largely to blame for this rejection of perceived outsiders. The Jewish ‘right’ to the homeland exempts some people and not others from being viewed as threats, as evidenced at the airport by the Persian Jew’s assertion of his background in order to show the ‘injustice’ of his selection for security screening, and at checkpoints by my own Jewish friends being skipped over in order to make time to profile me and Sundus. Ethnic exceptionalism also fuels the perception of African immigrants as “cancers,” while demographic concerns make them into “infiltrators,” in the words of Israel’s own Prime Minister. The tensions over changing demographics and the nature of future state rule dates back to the surge in Jewish settlement even before WWII, but such concerns now prevent the formal annexation of Israeli-controlled Palestinian territory—while the long history of conflict all but culminates in recent hate crimes and racist comments made by leading Israeli politicians. I understand that much of this hate is also reciprocated by some Palestinians and many other Arabs, and it saddens me to see a political conflict involving certain Jews result in anti-Semitism, by definition a racism toward Jewry as a whole. However, others’ pernicious logical fallacy of racism does not then justify the same on the Israeli side. And as long as Israel continues to dominate the lands and lives of Palestinians in its midst, it is clear that, for now, one racism has a greater impact on the fortune of its victims. 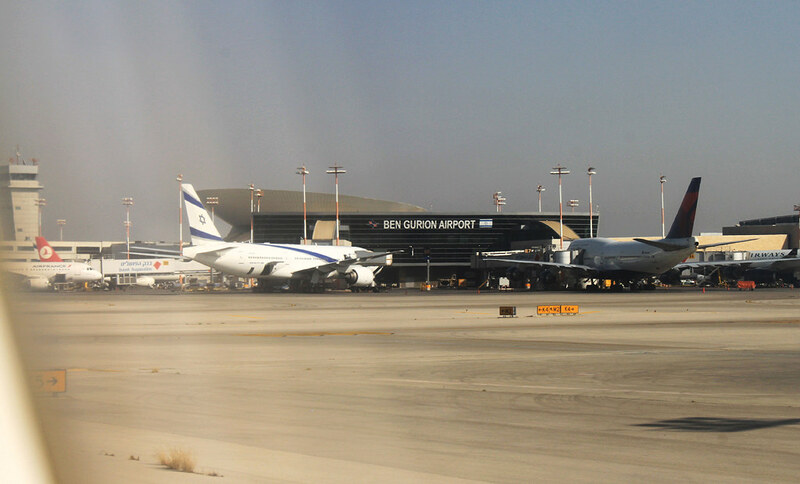 For many visitors to Israel, an airport is just an airport—but I was not so lucky. Sundus and I were detained for hours at Ben Gurion Airport, and the reasons behind this are revealing of problems that reach beyond incompetent customs officers. When I later spoke to my father about it, he said with a sort of pessimistic optimism, “Well, at least you weren’t in Saudi Arabia. There, they could have just taken you away and we would never see you again.” I found it funny that he would make this comparison, since I have heard many defend Israel by saying that other countries are worse, with Saudi Arabia being the prime example. But such a comparison implicitly acknowledges that something is in fact still wrong. Israel faces the pervasive problem of racism; whether it is worse or better elsewhere is besides the point. This is a racism that left me feeling totally unwelcome as soon as I entered the country; it also resulted in hours of excessive security screening as I departed, making me feel even more unwanted upon leaving (and almost causing me to miss my flight). I seriously can’t remember ever feeling so relieved to be back in the United States as when I had just flown out of an Israeli airport. And I feel truly discouraged from traveling to the country again because of what might happen when I arrive and the real possibility of me being sent back home without Mark there to vouch for me. To be crystal clear: I really had an absolutely amazing time during our stay; I met many great people and learned a lot. I want to return so badly; I cannot emphasize this enough. But unlike many others who visit Israel, I have no reason to expect a warm welcome upon returning. I know many of my Jewish friends are saddened that a country they love could make me feel this way. And others will try to reassure that Israel is so much more than my experience can show. However, my point, as I have tried to expound above, is not that this is *the* Israeli experience, but that this is the Israeli experience for certain groups of people. This isn’t an Israel of anomalies or isolated incidents, but this is Israel for Muslims, African immigrants, and, above all, Palestinians. Unfortunately, the injustice behind my airport detention has grave implications far beyond my own tainted experience. And if one day I feel welcome to this country, it can only be the result of major systemic and societal changes that proscribe such injustice. UPDATE: I didn’t clarify earlier, but the objectives of the program that brought me to Israel in the first place include “Inspire respectful dialogue as a tool for building mutual understanding between people of different faiths and backgrounds,” and “Facilitate engagement with organizations and leaders in the Middle East working to overcome religious, cultural, ethnic, and political prejudice and hostility in the region.” The irony should not be lost on anyone. Thank you for reading. The city looked more welcoming from the sky. I stumbled upon this blog and I had to comment. I’m going to Israel for the first time this summer (an academic conference). I’ve decided to get my passport changed to my husband’s name (the much more “American sounding” Jones) in the hopes that I can avoid having to deal with this. I figured this is how it worked in Israel if someone has a Muslim sounding name, but it’s nice to have a first hand account to read from a “regular” person. Such a shame what you and the other student had to endure. Treated like a criminal without doing anything wrong. It’s also a shame that some Americans actually favor an Israeli style airport security system. I had my carry -on checked at Baltimore airport randomly because I was the first brown skinned person in a long line of white folks before boarding the plane. By the way ask your dad about his family so you are not at a loss when some security personnel asks about your paternal lineage in your future travels and may be why you never saw them.